The selection of the different life history traits are interlinked by the population dynamic feed-back selection that is illustrated in the figure. Symbols relate to the average in the population, and the coloured circles symbolise individual home ranges with interactive competition in zones of overlap. Winners (dominating colour) are monopolising resources, and this generates a body mass biased resource access that is proportional to the slope of the multi-coloured bar in Centrum. While it is the interactions between the individuals and the cost gradient per interaction (ψ) that generates the resource bias, it is the evolutionary setting of the average frequency of interference competition (ι) that determines the slope of the multi-coloured bar in Centrum. Hence, the horizontal line that illustrates that the density dependent resource bias is determined by the invariant interference [ ι** ∝ 1/ψ ] of the selection attractor on mass. The ι** attractor is given by the feed-back selection of the outer ring of symbols [ r:population growth → γ:density regulation → n*:population abundance → ι:interference level → w:selection on body mass → r:population growth]. 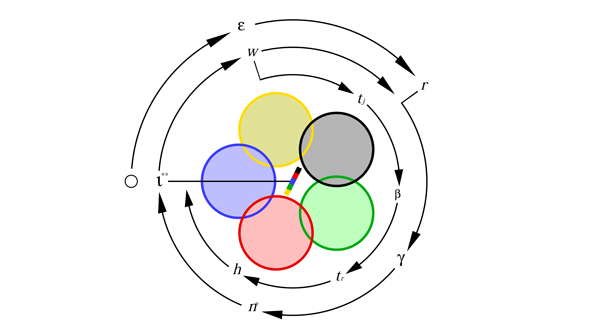 A selected change in mass is then initiating the inner loop of mass-rescaling selection [ w:mass change → tj:rearing period → β:metabolic rate → tr:reproductive period → h:home range → ι:interference ], with both loops adjusting to the invariant interference attractor. The black o to the left represents the origin of self-replication. Selection for an exponentially increasing net energy (ε) maintains a relatively high r, and continued feed-back selection for an exponentially increasing mass. The flow diagram illustrates how the feed-back is linking the selection processes on body mass and other traits, but it does not in itself explain the exact scaling of the different traits with mass. This scaling is contained in the equations behind the diagram, and we need to solve the equations to obtain the exponents and intercepts of the body mass allometries.